I hope today you receive the attention and respect that you deserve. And I also hope that every day of the year you are loved and appreciated for the things that you do. Because I see no reason to fool ourselves, this world be nothing without us. And being calm, considered and balanced, and also life planner, scheduler, home builder, organizer, friend, lover and a pillar for everyone, sure as hell deserves recognition and gratitude, not only today but 24/7, 365 days. But today is all about us, for a day you can let your self be stupid and spoiled, and let someone else take care of you for a change. So devour the things that you love and treat yourself. You deserve it. I made an extra special cake to celebrate. 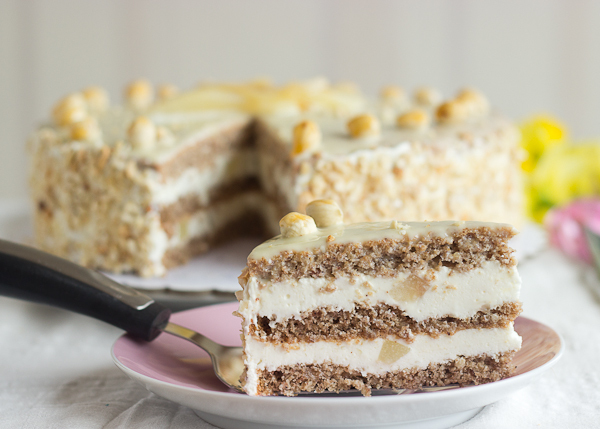 Because I am still in winter mood, I used hazelnuts and pears, and a light cream to hold everything together. This cake is quite easy, actually, compared to my usual ideas. There are only two different elements, and the cream is pretty effortless. The result however is moist, luscious but not overly sweet and the taste is sumptuous. No need to be humble here, I am very happy with the result. So, enjoy it and be very happy today! Preheat the oven to 180°C (350°C). Whip the egg whites in a large bowl with a mixer on medium speed until foamy. Add half of the sugar and increase the speed to high. Whip until stiff peaks form. In a separate bowl mix the egg yolks with the sugar and beat with a mixer on high speed until the ribbon stage. Gently fold the egg yolks into the egg whites, add the vanilla extract. 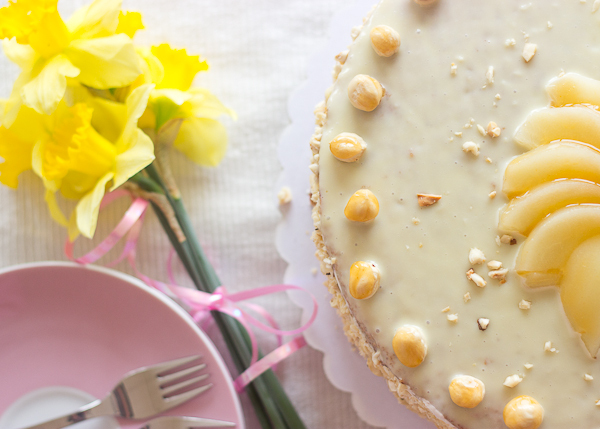 Mix the hazelnuts, almonds, flour and baking powder and stir with a wire whisk. Gently fold the dry ingredients into the eggs, in three additions, until fully mixed, trying not to deflate the mixture too much. Line the bottom of a 25 cm. (10 inches) springform pan and butter the sides. Bake for 25-30 minutes or until a tooth pick inserted in the center of the cake comes out clean. Let cool in the pan for 15 minutes and transfer to a wire rack to cool completely. Peel and core the pears and cut them in half. In a small saucepan bring the sugar, water, lemons and brandy to a boil over high heat. Turn down the heat and let the mixture simmer gently. Place the pears in the pot and put a place that fits into the pan over them, to keep them submerged. After 5 minutes check the pears with a thin knife, it should be able to pierce the fruit easily. Don’t let the pears get mushy, they should be soft, but hold their shape. Take the pears out of the pot. Reserve 1 cup of the poaching syrup. Chop four pears in small cubes and leave one of the pears for decoration. In a large bowl mix the yogurt, sour cream, sugar and zest, beat with a mixer on medium speed until smooth. Sprinkle the gelatin over the cold water and let sit for 5 minutes. Heat in the microwave on low, on 30 seconds intervals and stir after each one, until the gelatin is completely dissolved. Add the gelatin and the pears to the yogurt and mix well. Set aside until the mixture starts to thicken slightly. Pour the heavy cream in a large bowl. Whip the cream with a mixer on high speed until stiff peaks form. Set aside one cup whipped cream to use for decoration. Fold the remaining whipped cream into the yogurt mixture. Bring the heavy cream to a boil and pour it over the chopped chocolate. Let sit for a few minutes and stir until fully mixed. Let cool until the ganache begins to set. Cut the cake horizontally, forming three equal layers. 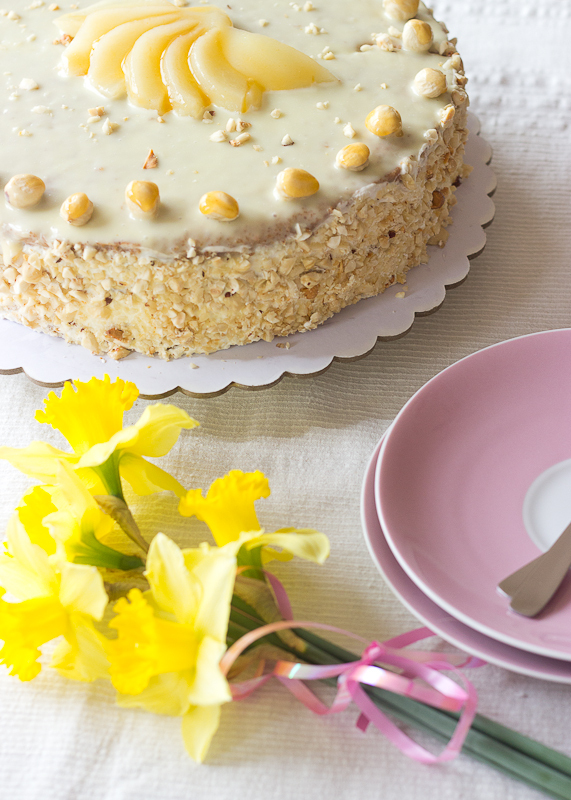 Place the first of the layers in the springform pan that you used for baking the cake. Using a pastry brush soak the layer with the poaching syrup and pour half of the cream over it (if the cream is thicken too much reheat it slightly over a water bath stirring constantly until it loosens). Place the second layer over the cream, brush with poaching syrup and pour the remaining cream over it. Place the last layer, soak it with syrup and pour over it the white chocolate ganache. Leave the cake set in the refrigerator for 2 hours, preferably overnight. Finely chop the hazelnuts, leaving ~15 hazelnuts whole. Release the cake from the springform pan and spread the whipped cream to the sides. 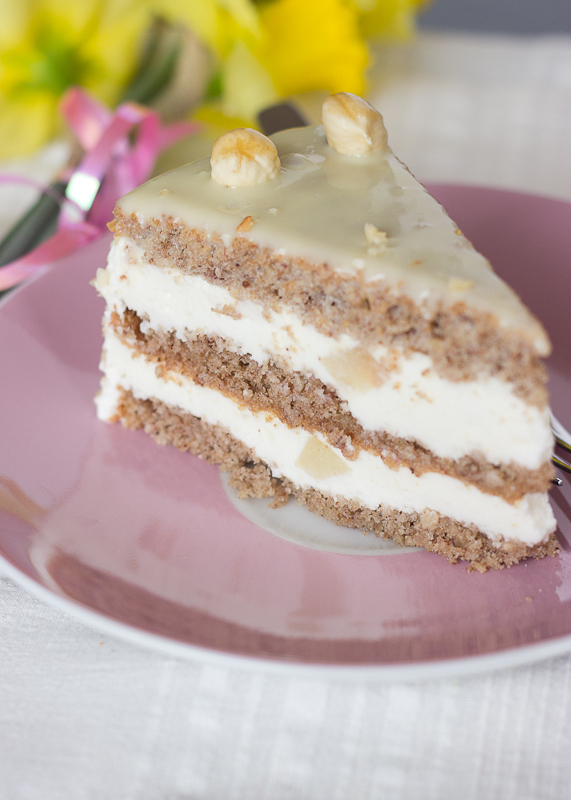 Use the chopped hazelnuts over the sides of the cake. 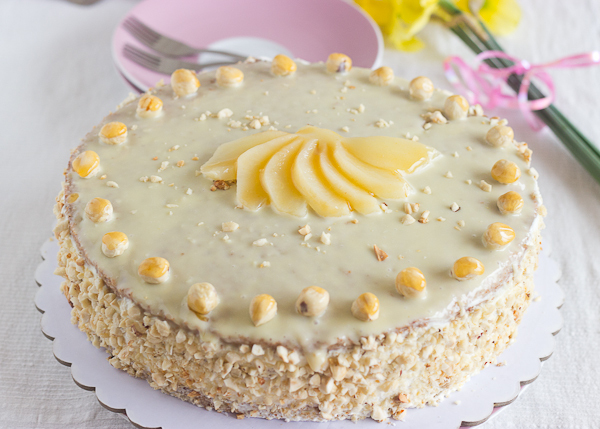 Decorate the top with the remaining hazelnuts and the fanned pear. Brush the hazelnuts with apricot glaze. Wow. That looks soo delicious! I can’t wait until fruit season comes so I can make that beautiful cake! Thank you! Hope you will like it as much as I did.